First responders, emergency medical personnel, star athletes -- all perform remarkable feats in the face of intense stress. But how often have you heard of athletes, businesspeople, students, or performing artists who had remarkable talent and enormous potential, but never achieved the success for which they seemed destined? Why do some people rise above adversity and excel under pressure, and others doubt themselves and panic -- or choke? What separates them is attitude. Resilient people meet adversity head-on and bounce back from setbacks. They seem to exude a natural inner strength. But studies show that they're rarely born with this outlook; rather, it develops over time. In fact, as this book will show, you can develop the attitudes that shield you from stress and help you overcome obstacles. 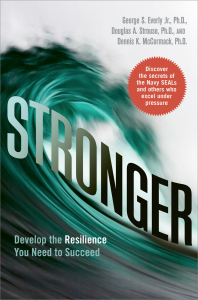 Drawing on decades of research, scientific analysis, interviews with nearly 1,000 highly resilient people working in unusually stressful professions, and the unique perspectives of a standout team of authors -- a stress-management expert, a skilled entrepreneur, and a Navy SEAL -- Stronger analyzes the heroic exploits of the Navy SEALs and others who succeed against all odds, pinpoints the traits that define the most resilient people on earth, and reveals how you can develop this vital competitive advantage at any age. Change any situation for the better -- and live a more satisfying and happy life. Why let problems keep you from moving forward? With Stronger you'll develop the life-changing ability to not just withstand adversity and extreme pressure, but to succeed under even the most challenging conditions. Competing in today's world calls for deep reserves of strength -- in sports, academic placements, auditions, promotions, or entrepreneurial success. Let Stronger give you the competitive edge you need to withstand the pressure and achieve your best!